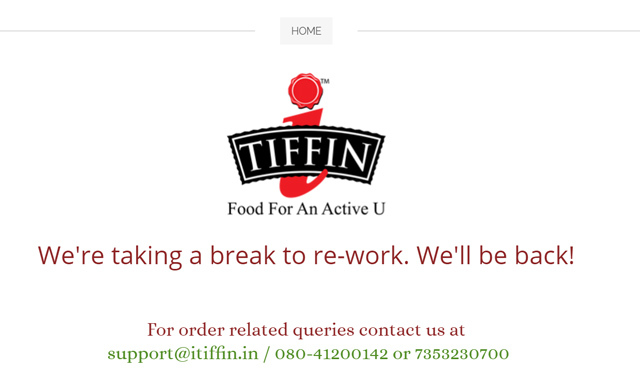 Bangalore-based online meal service provider iTiffin.in has stopped taking orders and advised employees to look for jobs, in yet another reminder of distress in the food-tech sector despite new ventures continuing to raise funds. Three people familiar with the development told Techcircle.in that iTiffin's website has been inactive since March 25. The company has also stopped taking orders on its mobile app. The people said that the company has officially told employees the portal might resume operations in May. The development comes at a time when food-tech startups such as Dazo, TinyOwl and SpoonJoy have either shut shop or downsized operations while companies including First Eat, Cookaroo and FreshMenu have attracted investors. Dazo, operated by TapCibo Online Solutions Pvt Ltd, closed operations in October last year. Mumbai-based food ordering app TinyOwl has laid off about 200 employees. Foodpanda, one of the biggest names in the food-tech space, is looking to sell its has reportedly put its Indian unit on the block though the firm denies this. On the other hand, FreshMenu raised $17 million in Series B funding in January while First Eat and Cookaroo are among the ventures that have secured seed or angel funding. Tapan Kumar Das and Ryan Fernando, iTiffin's founders, declined to comment. However, a message on the website reads: "We're taking a break to re-work. We'll be back." One of the three people cited above said the company has informed the staff the website is being shut down for maintenance but has asked them to look for other jobs. This person, an iTiffin employee who didn't want to be named, said the staff has been told that their dues will be cleared in 20 days' time. A second person said the company has pulled the website down due to ongoing maintenance work and kitchen renovation. "It would take at least a month for the website to relaunch," he said. "Meanwhile, employees have been given the option to either wait until the operations restart to join back or consider other job opportunities." It couldn't be immediately confirmed whether this is a permanent shutdown or a temporary one. However, the fact that some employees have been asked to look for other options doesn't paint a rosy picture of a startup that, unlike many other food-tech ventures, operated on a full-stack business model with its own kitchen and supply chain. iTiffin, owned by Corporate Wellness Solutions Pvt Ltd , was founded in early 2013 by Das and Fernando. The duo put in Rs 10 lakh and raised Rs 1.5 crore from cricketer Robin Uthappa to set up the venture. In August 2014, the startup raised $1 million in a seed round from a large Indian family office. It was subsequently looking to raise a Series A round of $6 million to expand to other major cities. The startup, which offered tiffin based on a defined calorie count requirement, followed a subscription-based business model. It operated with a team of about 100 people that included food and nutrition scientists and expert chefs, who could supply nearly 20,000 meals a day. Das, a chartered accountant and an IIM-Ahmedabad alumnus, has previously been vice president of finance at Flipkart. Fernando, also an IIM-Ahmedabad alumnus, has a masters' degrees in food biotechnology and biochemistry. Fernando also runs Qua Nutrition, a company that advises celebs on diet plans. The article has been updated to incorporate a comment related to Foodpanda.